HAPPY BIRTHDAY FRANKENSTEIN, PROMETHEUS, DEVIL, MONSTER, FIEND, WRETCH, CREATURE, DEMON, IT. 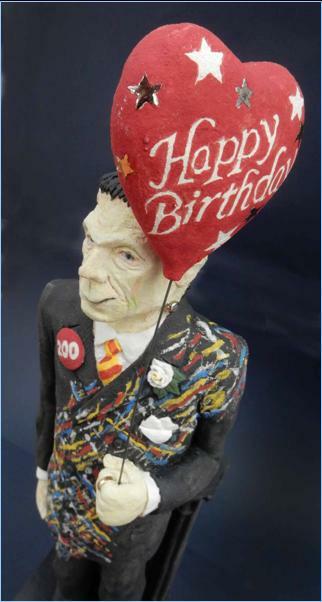 Frankenstein celebrating his 200th birthday dressed in his best Jackson Pollock suit, having exchanged his four inch platform shoes for a pair of highly polished black brogues and sporting a balloon. An acknowledgement to Mary Shelley whose ground-breaking book was first published in 1818 - 200 years ago this year. The name in common usage is the name of the monster’s creator, Victor Frankenstein. Mary Shelley in the book uses various “names” – devil, monster, fiend, wretch, creature, demon and it. The creature himself suggests that Adam might be an appropriate name. The figure is based on Jack Piece’s design for the 1931 Universal Pictures film, starring Boris Karloff, which is the image that most people conjure up as Frankenstein. Perhaps there is also a bit of Herman Munster lurking in the idea. T Material painted with underglaze colours and fired to stoneware. Gold and platinum lustres applied. 50cms high.